Deep is a well known snack brand from India, going back to 1977. 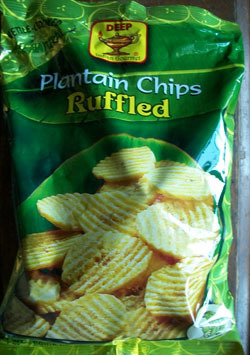 These nice and simple plantain chips contain just three ingredients: plantains, oil and salt. Plantain chips are typically crunchy but being kettle cooked and ruffled takes it up a notch. In addition to impressive crunchiness the flavor is hearty with a mild natural sweetness. The subtle sweetness combined with the salt makes these a very addictive chip. Other flavors include original, masala, mari and tomato. The bag was 7oz (200g) for $3.99 at Foods of India (Sinha Trading company) located 121 Lexington Ave @28th St. Deep items can also be found at Little India (128 E 28th) and at Patel Brothers in Jackson Heights Queens. Some items can be ordered online as well. Thanks. Very satisfying snack. Thanks for the comment. Cheers!